Is this yet another Oscar contender for Woody Allen? In my opinion AND the opinion of other screeners tonight, if Cate Blanchett isn't short-listed for this year's Best Actress, there is no justice. As a matter of fact, in this award-winning assembly there is NO weak performance. I sat there marveling at the talent and skill on display. Blanchett (from Australia) and Hawkins (from the U.K.) played American sisters without a hint of accent. 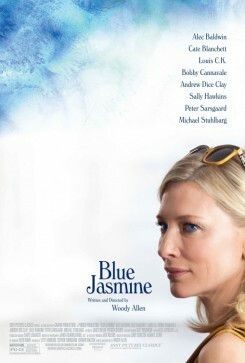 Furthermore, no one in this film had to do that irritating Woody Allen stammer. Yippee! This is one of Allen's most accessible films since "Match Point." This excellently crafted PG-13 script slowly unveils events in Jasmine's past. We couldn't help but hear the mature man/teenage lover defense with Mr. Allen's notorious past in mind, and some of the relationships evoked echoes of Tennessee Williams' "Streetcar..." Between Allen and Blanchett, they have created a realistic and relatable melt-down! I love it when there are no bad guys or good guys, just people with human failings and various levels of desperation, trying to get by.